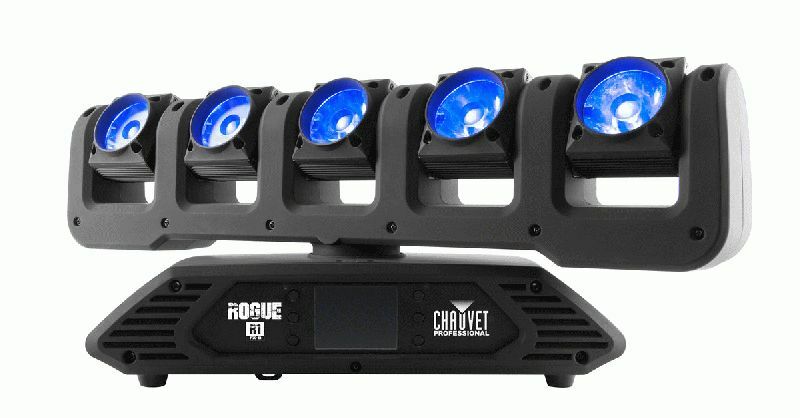 You can count the number of moving heads on the Rogue R1 FX-B on one hand, but it would take another hand, both feet and a lot more to count all of the stunning looks that can be created with the latest addition to CHAUVET Professional’s popular Rogue series. With its five individually controlled pixel mappable 15-watt RGBW LEDs, strikingly fast movements, and infinitely variable pan and tilt options, the new Rogue can create an endless variety of high impact looks. Capable of producing stunning sweeps across a stage or dancefloor and mesmerizing crossing patterns, the compact fixture can also deliver crisp well-defined aerial effects thanks in part to its 7⁰ beam angle. With an illuminance of 5,361 lux at 5 meters, any look created with the fixture will be bright and intense. Packed with a plethora of performance features, the Rogue R1 FX-B has 16-bit dimming of the master dimmer, as well as individual colors for smooth control of fades. Built-in color macros add even more options to the lighting designer’s creative toolbox. For even greater creative possibilities in pixel mapping, the fixture can be used in a dual mode allowing the pixels to be operated by a separate controller from the rest of the functions. Control of the Rogue R1 FX-B can be achieved via DMX, Art-Net, sACN or Kling-Net. The fixture also offers the LED advantages of long lamp life (50,000 hours) and low heat generation. Thanks to its quiet operation, it is also ideal in applications where noise is an issue. Although compact – measuring 25.19 x 7.05 x 9.72 inches (640 x 179 x 247 mm) and weighing 24.2 lbs. (11 kg) -- the new Rogue is also rugged, making it likely to turn up on tours in venues of all sizes.